PHOENIX — When it comes to picking up a few pointers before spring turkey hunts begin later this month, where does one begin? Look no further than the Arizona Game and Fish Department (AZGFD), along with its extensive network of partnering organizations, which offers dozens of events throughout the year to suit almost everyone’s needs through the Outdoor Skills Network. 1-4 p.m. Saturday, April 6: Location: AZGFD’s regional office, 2878 E. White Mountain Blvd., Pinetop. Topics include calls and effective calling, camouflage selection, shotgun and ammunition selection, scouting and preparation, and more. 5:30-7:30 p.m. Wednesday, April 10: Location: Sportsman’s Warehouse, 2231 E. Route 66, Flagstaff. Brian Wooldridge, a biologist, sportsman and turkey hunter, will share his passion for turkey hunting and conservation. Learn tools and techniques for a successful hunt, including turkey-calling demonstrations. 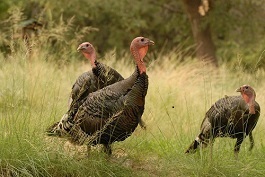 For more information, and to register for these spring turkey hunting and calling seminars, visit https://www.register-ed.com/programs/arizona/170-outdoor-skills-network/name:turkey. For more information about the Outdoor Skills Network, including a complete listing of hunting, fishing, shooting, trapping and other outdoor skills-development events and activities scheduled throughout the year, visit http://www.azgfd.gov/OutdoorSkills.